WELCOME TO NIGHTTIME MANCHESTER on the last weekend before the clocks go forward - and the evenings suddenly get shorter. They say Manchester is the city with the best nightclub scene in Europe - but tonight I'm walking the city centre streets and capturing the scenes around me. I'm starting not at a glamorous night spot or, but on deserted Travis Street, off Fairfield St - a gloomy side of the city that has an atmosphere that's somehow quintessentially 'old' Manchester. The viaduct, first built 1842, carries the tracks leading from Piccadilly Station onto the main line to Stockport and London and was widened in subsequent years. 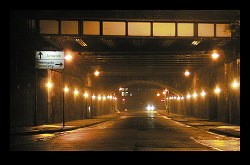 It's like a tunnel, often dripping rainwater, the sound of traffic and footsteps echoing around - Like many streets nowadays, it's brightly lit by high pressure sodium vapour lamps, but it still hasn't lost its moody appeal. Jutland Street, near Piccadilly Station, uniquely preserves something of the 'old' Manchester, with its setts, or cobblestones. It was the subject of a drawing by LS Lowry. Here we see it in 1998, before construction of a development of apartments. At the top of the street is the Ashton Canal basin, at its junction with the Rochdale Canal (hence the its former name Junction St - I don't know why the name was changed) and at the bottom is Store St, which runs above the course of a small river. We are standing at the junction of Store St and London Road - a tram is entering the Metrolink terminus - blurred due to the one second time exposure. To the left is Piccadilly Station, built above street level. To the right is the Old Fire Station. We're on London Road, looking towards the city centre. A Metrolink tram waits to enter the Metrolink terminus, built in the undercroft of the station, which is supported on cast iron pillars. In early 2000, an extension of the Metrolink system was announced, and the line will be extended through the station and east to the Commonwealth Games site and Ashton. A tram is waiting at Piccadilly Metrolink station - it has come from Broadway, on the new line through Salford Quays, and is just about to complete the journey to Piccadilly railway station. On the upper left is the jutting form of Piccadilly Plaza, completed 1965, overlooking Parker St bus station. It's about 7pm, but buses are strangely thin on the ground at the moment. 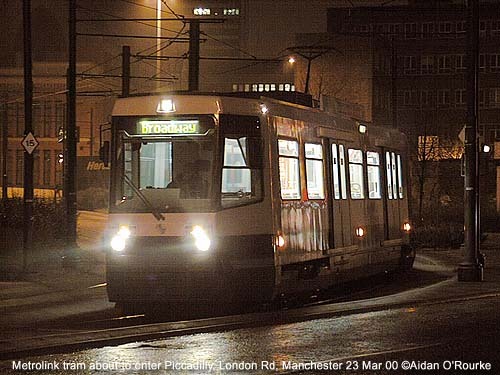 A lone passenger has just got off the Metrolink tram and is heading towards Portland Street. This is a panorama of Portland St at the corner of Parker St. According to Manchester City Council's 1999 redevelopment plan, a building will be constructed on this part of Piccadilly Gardens, occupying the area roughly in the centre of the panorama. Click to see this scene by day and my rough visualisation of the building. Piccadilly Gardens at night is a rather seedy place, mainly as a result of the run-down state it's in, attracting a type of night time visitor most of us would rather avoid. But many of these nocturnal lingerers are just people who've fallen on hard times - every night, a charity provides drinks and snacks for them in the far corner of Piccadilly Gardens. 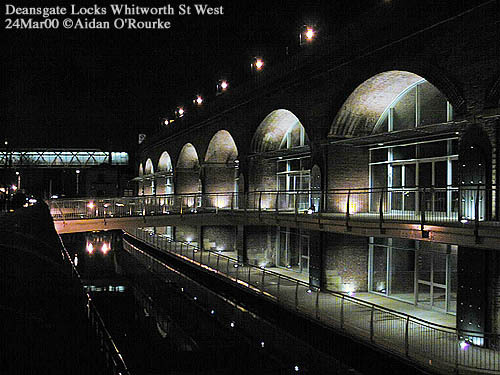 This is the Britannia Ringway hotel, on Portland Street, as it looked in early 1997 - the lights look magnificent, picking out the outlines of the building it occupies - the Cook and Watts warehouse, built 1858. The Britannia Hotel has bars and night clubs, and a reputation as the place where actors and pop stars like to stay. Round by the side of the Britannia Hotel is Minshull Street - home of the City Police Courts, on whose doorstep, ironically, you'll find ladies of the night offering their services- there weren't any around when I took these photos, one from either end of Minshull St - but soon after, they appeared. The infamous Chorlton Street coach station, accommodated under the Chorlton St multi-storey car park is, a grim and unwelcoming place, open to the elements, with no toilet facilities after 6pm. The bus station a disgrace to Manchester, and is worse than the old Lower Mosley St bus station, now the site of the Bridgewater Hall. It's hoped Chorlton St bus station will be renovated in time for the Commonwealth Games in 2002. The single-decker bus in the centre has just arrived from Liverpool and is about to depart for Leeds. 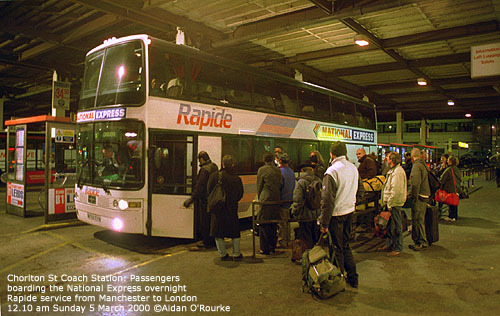 Every night at 12.10, the National Express Rapide service departs from Chorlton Street coach stationfor London - the overnight journey takes about six hours - daytime services cover the 186 miles (300km) in about four hours. 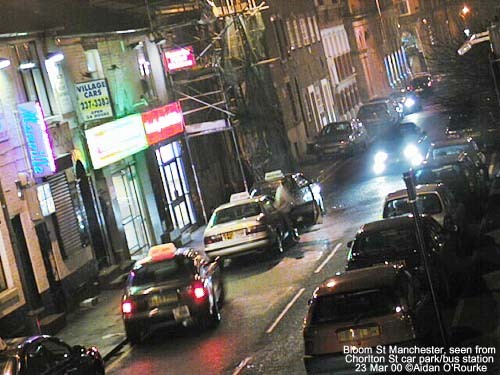 Just a stone's throw from Chorlton Street Bus Station is Canal Street, centre of Manchester's world-famous gay scene, as featured in the Channel 4 TV drama "Queer as Folk". Canal Street, similar to a street of the same name in New York, was once a run-down warehouse district, but now it's lined with fashionable bars, pubs and nightclubs. This is the glamorous face of the Gay Village. Bloom Street, just next to Chorlton Street bus station and car park, retains the character of earlier, pre-Village days, when things happened a lot more furtively than they do today. On the corner, just off the picture to the left, is Napoleon's night club. Further down on the right is the bar New York New York. Walking through this scene after taking this photo, someone with a desperate tone in his voice, shouted "Hey, you, come for a pint with me, will you...". It's amazing how fast your legs can carry you when confronted with certain situations on the street at night. This is the New Union pub, on the corner of Canal St and Princess St, a key landmark in the Gay Village, and featured prominently in the Channel 4 TV drama "Queer As Folk". The former industrial area on either side of the Piccadilly to Oxford Road railway line, next to the River Medlock, is now UMIST - the University of Manchester Institute of Science and Technology. 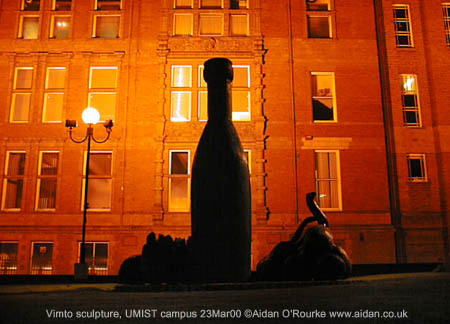 But the industrial heritage of the area is celebrated by this sculpture, silhouetted against the south facade of the UMIST main building. It represents a bottle of Vimto, together with the fruity ingredients of this celebrated fizzy drink, which used to be manufactured on this site. Looking from the Rochdale Canal bridge towards the Refuge Building, now Palace Hotel, the tower of the hotel is reflected in the water. Everywhere we look, old commercial buildings along the canal are being converted into hotels, bars and apartments. New hotels and residential blocks are also being built, transforming the city centre. 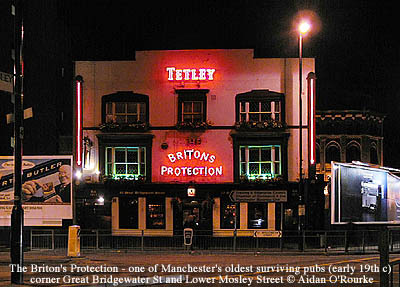 The Briton's Protection is one of Manchester's oldest surviving pubs. Despite new developments on all sides, it remains defiantly unchanged, true to the spirit of its name. 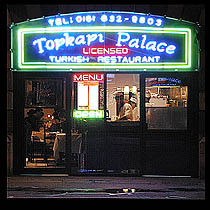 At night it's like a beacon with its red neon signs - the attractive symmetrical facade is a familiar landmark as you go south out of town by car or Metrolink. The Briton's Protection used to overlook the former bus station at Lower Mosley Street - one of my strongest memories of nighttime Manchester is from the mid-nineteen-sixties, departing on the overnight coach to London from Lower Mosley Street bus station, with its white cream exterior tiles and white railings. The coach - a Leyland Leopard, with distinctive "skylight" windows, left at 11pm and arrived in London around 7am the next morning. 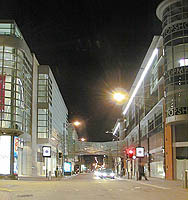 A few years later, Manchester's main bus station moved to Chorlton Street, and the Lower Mosley St site was used as a car park until the construction of the Bridgewater Hall. Here are a few 'taster' images to be going on with..